NEW HAVEN, Conn.--(BUSINESS WIRE)--Alexion Pharmaceuticals, Inc. (NASDAQ: ALXN) and The Connecticut Green Building Council (CTGBC) today announced that Alexion’s global headquarters at 100 College Street in New Haven has achieved LEED Platinum certification for Commercial Interiors. LEED Platinum is the highest level of green building certification through the U.S. Green Building Council (USGBC) and Alexion is one of less than 15 buildings in Connecticut to earn this prestigious certification. Alexion achieved LEED Platinum certification for implementing measurable strategies and solutions aimed at achieving high performance in various areas of building. The Company’s 14-story global headquarters features a green roof top, renewable energy sources, high-performance fixtures designed to save water, and materials such as paints and adhesives that provide increased air quality for building occupants. More specifically, the building will save approximately 778,000 gallons of water per year, 50 percent of electricity will be drawn from renewable energy sources, and 90 percent of occupied areas will have access to natural light, among other benefits. Alexion is a global biopharmaceutical company focused on developing and delivering life-transforming therapies for patients with devastating and rare disorders. Alexion is the global leader in complement inhibition and has developed and commercializes the first and only approved complement inhibitor to treat patients with paroxysmal nocturnal hemoglobinuria (PNH) and atypical hemolytic uremic syndrome (aHUS), two life-threatening ultra-rare disorders. In addition, Alexion’s metabolic franchise includes two highly innovative enzyme replacement therapies for patients with life-threatening and ultra-rare disorders, hypophosphatasia (HPP) and lysosomal acid lipase deficiency (LAL-D). Alexion is advancing its rare disease pipeline with highly innovative product candidates in multiple therapeutic areas. More information about Alexion can be found at: www.alexion.com. The U.S. Green Building Council is a non-profit trade organization that promotes sustainability in how buildings are designed, built and operated. The LEED certification program was developed to provide property owners and operators with strategies for improving the performance of buildings through energy savings, water efficiency, indoor environmental quality, stewardship of resources and other measures. By using less energy, LEED-certified buildings save money, reduce greenhouse gas emissions, and contribute to a healthier environment for residents, workers and the larger community. More information about the U.S. Green Building Council is available at www.usgbc.org. 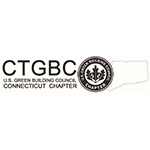 The Connecticut Green Building Council (CTGBC) is a chapter of the U.S. Green Building Council. CTGBC seeks to improve the quality of life in Connecticut through the promotion of intelligently designed and constructed high performance energy efficient buildings. More information about the Connecticut Green Building Council can be found at http://ctgbc.org.